Bethlehem Steel announced its first-ever signing on Thursday, Philadelphia Union Academy midfielder Derrick Jones. “We’re absolutely ecstatic to have a player of Derrick’s caliber join our club and we can’t think of a more fitting player to be our first signing,” Bethlehem Steel head coach Brendan Burke said. “Over the past few years, he’s shown us his great potential both at the Academy and at First Team training, and we couldn’t be happier to keep him within our organization to continue his development. As we begin to build a competitive team for next season, I think this move speaks to our commitment to serve as the vital connection between our great Academy and the Philadelphia Union. 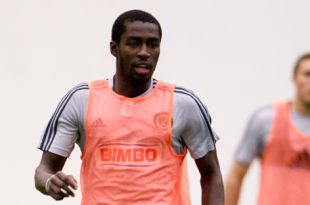 Jones has spent a good deal of training with the senior Philadelphia Union squad, joining the team in Florida for the 2015 preseason, along with forward Yosef Samuel. The attacking midfielder, whose full name is Derrick Jones Amaniampong, emigrated to the US from Ghana in 2012. The former Ghanaian U-15 international, played for local side Junior Lone Star before joining the Union Academy, and was a fulltime student at the YSC Academy. February ’15 memories are hazy, at best. I think he saw the field in the game that had three separate teams on the field in three 30 minute segments. He did not stand out either positively or negatively within that vaguely organized relative chaos, but few people did. My guess was that Jim Curtin had promised that everyone would get more or less equal field time, and he did. Saw him play many times when he played for Lower Merion Soccer Club after just getting here. He was huge (much bigger than those his ‘age’). Won’t matter now; wish him all the best and hope he’ll make it to the first team! Good that they made a first signing. But lets speed the process up a bit you have 2 rosters that need filling before March and preferably you should have the entire rosters ready before then. Some urgency please so we can get these guys learning what the plan and style of play is. Another introvert here… I never post comments on blogs, but I want to join the "read what you want, where you want, on your own time, alotu&qeon; party.